Travel through Rotterdam on a Segway. 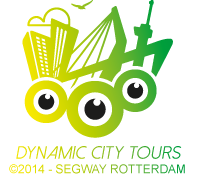 Segway Rotterdam offers different tours and packages. Move through Rotterdam on a Segway. A unique means of transport which allows you to tear through the streets. With a Segway the city is a dynamic and relaxed sightseeing. You control the Segway with your body. By leaning forward, the Segway by leaning forward and backwards to drive the Segway backwards. It stops when you in an upright position. You will be guided by an experienced guide. He will first give you a practical instruction. You will tour along all highlights of Rotterdam on a remarkable vehicle. No bridge is too high, no quay too long. An unique experience for groups, tourists and for you! We offer Regular tours but also tours that you and your group/company came up with. Groups with nine persons can choose/create there own tour. Ask for the options/possibilities or ask your plan (s) to us. Also for company outings, we are open to suggestions and ideas. Segway Sightseeing Rotterdam is one of the many attractions that Wielders Management has to offer. All attractions have one thing in common: water! Because we have an unique location, at the Maas. Because the water offers an awesome view of the skyline. Because sailing is relaxing. Because the Maas offers numerous adventurous and recreational possibilities. Because the Maas is the heart of Rotterdam.